Horses continue to be my obsession and this time i tried to capture a herd instead of a single horse. 'Rolling Thunder' is an acrylic and oil pastels painting on 24"x36" canvas and available as original and artist enhanced original prints. With Valentine's Day approaching, love is in the air!! Inspired by the great artist Afremov Leonid, I just finished my latest painting - You&Me. It is said that life is a journey and not a destination. And it is love that makes the journey worthwhile !! Hope you all are finding the journey worthwhile. Happy Valentines !! 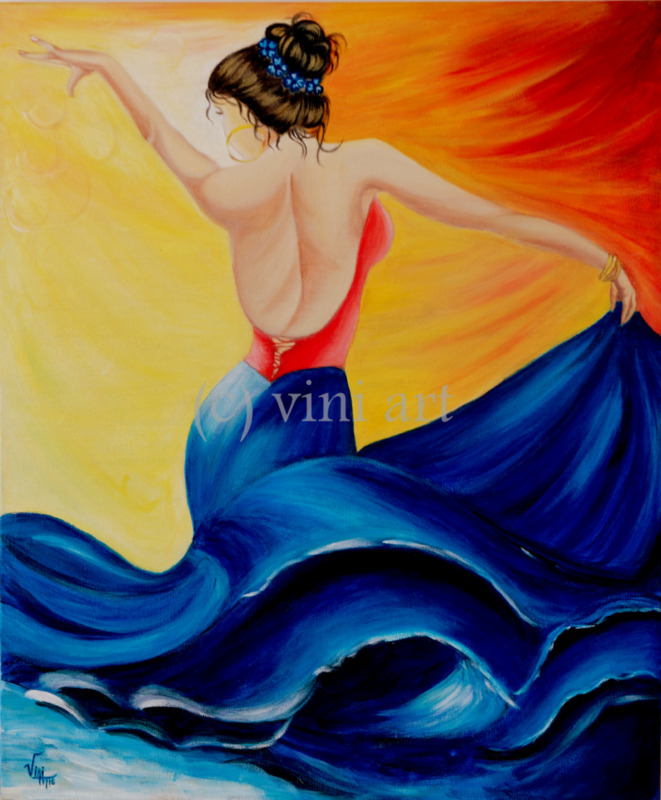 This painting, "Flamenco" is inspired by the spanish dance. Recently, we happened to see the dance live. This style of dance is usually performed solo, and is improvised rather than choreographed. Flamenco dance is known for its emotional intensity, proud carriage, expressive use of the arm and rhythmic stomping of the feet. "Misty" Found A New Home! Last week, I sold my latest painting Misty - "Misty" moved to Long Beach Island. It will be hanging in a beach cottage by the sea. I'm so happy it'll be a Christmas gift for someone! I loved painting "Jewel" so much that I ended up making another one- "Misty"! Horses are such beautiful subject to work on! Specifically, I had a lot of fun making Misty's mane. "Misty" and "Autumn" will be on display in Terhune Orchards in November, as a part of Creative Collective's display. If you're in the area during November, do visit Terhune Orchards! "Rainy Night" Found A New Home! Recently sold the painting, "Rainy Night" ! Very happy to see it on another wall. Thanks Mallika!! As it's just the starting of season fall, we all can feel the weather change. In few days we will see so many beautiful colors outside, Its one of my favorite season as it's not hot nor cold. To get the feel I made 'Autumn' just like that. I made this on acrylic paper 18" x 24". Enjoyed making this ! Now displaying "Distant Lover" at the Gourgaud Gallery in Cranbury town hall. It will be on display until the end of August. Viewing time is 1-3 pm on weekdays.